Domestically, there were many new purchase orders to keep us busy throughout March in addition to the previous month's bespoke analyser kiosks currently being progressed. Various Severn Trent Water projects required a number of Proam ammonia monitors for final effluent water quality measurement. Wessex Water purchased final effluent turbidity instrumentation. Birmingham Airport have purchased replacement Protoc TOC instruments. International Food and Flavours (IFF) procured a walk-in analyser kiosk to be equipped with our Proam analyser configured for chloride measurement with membrane sample preparation. Internationally our distributor for India has secured a refinery project requiring multiple Protoc TOC analysers. Additionally, we have supplied a Protoc TOC analyser complete with a pH and conductivity monitor to our Irish distributor for a project requiring surface water quality measurement. PPM has recently been awarded a tender contract with Birmingham Airport to supply four new Protoc 300 TOC water quality monitors. These new instruments will replace the existing TOC analysers previously supplied by PPM some fifteen years ago. The instruments will continue to provide continuous water quality measurement and control of surface water runoff from the hard standing. 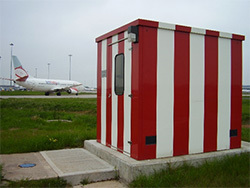 The existing engineered kiosks, originally supplied by PPM are still in good condition, so do not need to be replaced. This contract covers the supply of the new MCERTS Protoc 300 TOC model, keeping disruption to site monitoring to a minimum. The PPM service team will continue to give after sales service and maintenance support, along with on-site training for the new monitors to Birmingham Airport staff. Following a recent evaluation of the ion selective technology, IFF have placed a purchase order for a continuous final effluent monitoring station. The decision to install continuous real time measurement was taken to enable a more proactive approach to the waste water treatment process. The Proam analyser configured for chloride measurement, will be installed along with membrane sample preparation into a walk-in analyser kiosk. The instrument will continuously monitor final effluent water quality on the trade discharge. An automatic two-point calibration will be used on a daily interval, to maintain the operational performance of the instrument and to validate measurements. To date, automatic sample collection and laboratory analysis has been used to provide compliance data but this approach does not lend itself to real time control. The next build of Protoc TOC analysers is underway for our Indian Distributer, Forbes Marshall. Four Protoc analysers have been purchased for the Haldia Refinery; one instrument will have the testing witnessed by an independent inspector from Lloyds Register. The paperwork from the other tests, will also be verified for the client’s documentation portfolio. Three instruments are ranged 0-10ppm TOC for condensate return monitoring and one ranged 0-20ppm TOC for a cooling water application within the Refinery.